I am excitedly preparing for NUOVA's program this summer by working closely with my teacher, Dr Tracy Smith Bessette. I am working particularly on the baroque style and Purcell's unique musical language. For this task, I am meeting with several coaches and professors in the Early Music department at my school (McGill University) to pick their brains. I absolutely love singing baroque music and now I am finding as many articles, resources, and documentaries as I can get my hands on! To say I am thrilled to be working with Opera NUOVA this summer would be an understatement. Opera NUOVA’s program has always been a goal of mine since I started seriously singing classical repertoire. I have such great respect for the faculty, the program, and its students, I knew it would be a fantastic place for me to grow this summer. I really wanted to do NUOVA this summer in particular because I have so much technical and artistic work that I want to accomplish and I know that the faculty will help me do so. I also feel that Opera NUOVA will help take me a step closer to all the repertoire I hope to perform in the future. Canadian tenor Sean Haid brings energy and positivity to all the work he does. He is currently in his second year of undergraduate study at The Schulich School of Music of McGill University in Montreal, Quebec under the tutelage of Dr Tracy Smith Bessette. Sean can be found performing a variety of repertoire including 15th and 16th-century madrigals, Romantic Vocal Chamber works, opera, art song, as well as new works. Previous stage credits include Figaro’s Wedding and Ella (La Cenerentola) with Calgary’s Cowtown Opera, Carmina Burana and Mendelssohn’s Elijah with the McGill Concert Choir, and scenes from Albert Herring, A Little Night Music, Die Zauberflöte, and A Gentleman’s Guide to Love and Murder. Sean is also a fervent Shakespearean actor with credits including Malvolio in Twelfth Night and Demetrius in A Midsummer Night’s Dream. Sean is particularly excited to be performing two operas based on Shakespeare plays this summer with Opera NUOVA (Henry Purcell’s The Fairy Queen and James Garner’s Much Ado!). 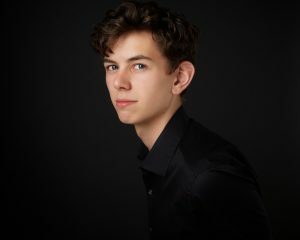 While still a student, Sean’s education has included several of Canada’s top programs for young artists including Canada’s National Voice Intensive with David Smukler and Gayle Murphey, COSA (Cowtown Opera Summer Academy) with Michelle Minke and Sara Staples. Sean is thrilled to be joining Cowtown Opera Company as social media manager for their 2018/19 Season. When not on stage or in the practice room, Sean can be found in the kitchen indulging in his love of cooking or in a yoga studio.